Revolutionize the way you camp! This 6-Person, 4-Season wnnideo pop up tent is incredibly easy to set up thanks to its pre-attached hub. Anybody can set this large tent up in one minute. The waterproof & UV resistant fabric offers excellent weather protection against rain and UV rays. And the Large arched double doors are easy for in-and-out. Multiple mesh windows offer good ventilation and view, and also keep nasty bugs out. 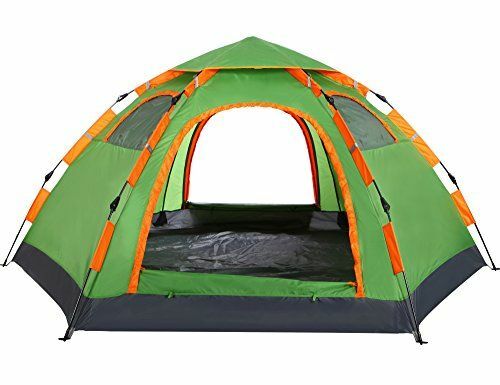 Spacious enough to sleep up to 4-5 people(4 adults or 65children and teens) , this pop up tent is ideal for a wonderful camping trip or a long excursion with your family. When the fun is over, this family tent can be easily folded down and fits in a convenient carry bag for easy transport and storage. Reliable Large Waterproof Tent: Stretch out on a queen-size airbed, enjoying the fresh air and views thanks to a ground vent and 2 large windows. For added peace of mind, stash small gear in mesh pockets along the tent’s walls. Stay dry no matter what with tub-like floors that use corner welds and inverted seams to keep water out. This 5-6 person pop up dome tent also features zippered privacy panels on doors and windows and keeps your gear organized with the included gear loft with lantern hook and organizer pockets. Tent Technology- water repellent fabrics with active bead technology for faster water runoff paired with sealed seams and rain-resistant door/window seals. Tent’s rainfly is removable in warmer weather to expose panoramic mesh windows and ceiling. Tent’s mesh ceiling allows hot air to escape keeping you comfortable all season. It was easy to set up and large enough for my 6′ … I bought this last week for our family of four. It was easy to set up and large enough for my 6′ tall husband to stand up in.The collapsible poles are lightweight and fit through sleeves in the roof of the tent. Opens like an umbrella. We had high wind close to 50mph and rain storm during the night, the tent held nicely and no water inside thetent. Overall, I think it was a good buy for me.